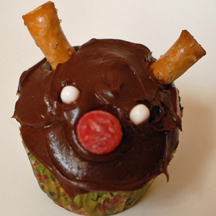 Here’s another take on reindeer cupcakes. Instead of using mini pretzels for antlers, make horns out of the thick style of pretzel. What You Need: 1 cupcake (baked and cooled); chocolate frosting; thick pretzel; red gumdrop; 2 Tic-Tac mints. How to Make It: Frost cupcake. Break pretzel and stick into cupcake to make two horns. Add gumdrop nose and Tic-Tac eyes. This entry was posted on Friday, December 21st, 2007 at 9:59 am	and is filed under Christmas cupcakes. You can follow any responses to this entry through the RSS 2.0 feed. Responses are currently closed, but you can trackback from your own site.